Last week we welcomed college student Jack to Thorpes HQ for a weeks work experience. Jack, like many others his age, is feeling a little unsure about what he wishes to do in the future, so we gave him the opportunity to create his own project and experience two very different roles this week, working alongside both the Marketing and Factory Teams. Read his excellent blog below to find out more about how he got on. On being told by my college that I was required to complete a work experience program, I was delighted. It was the chance to go out into the real world and experience what life would be like post-education. Previously, in the summer, I had completed three weeks work at Thorpes on the shop floor but for this week I decided I wanted to see more of how the factory ran and how it can appear to function effortlessly. As a student I am faced with the tough task of choosing possible career paths to explore and this week was the perfect way for me to experience a different side to business and broaden my horizons even more. Marketing Manager Jamie Thorpe introduced me to the roles and responsibilities he shared and immediately I was excited for the week that lay ahead. It wouldn’t all be office work though. Getting the chance to design my own project and carry it out on the shop floor was an opportunity I couldn’t wait to get started. In my previous experience at Thorpes I was assisting others and helping them out in any way that I could but this freedom was exciting, a chance to show off my skills and learn more about the trade. 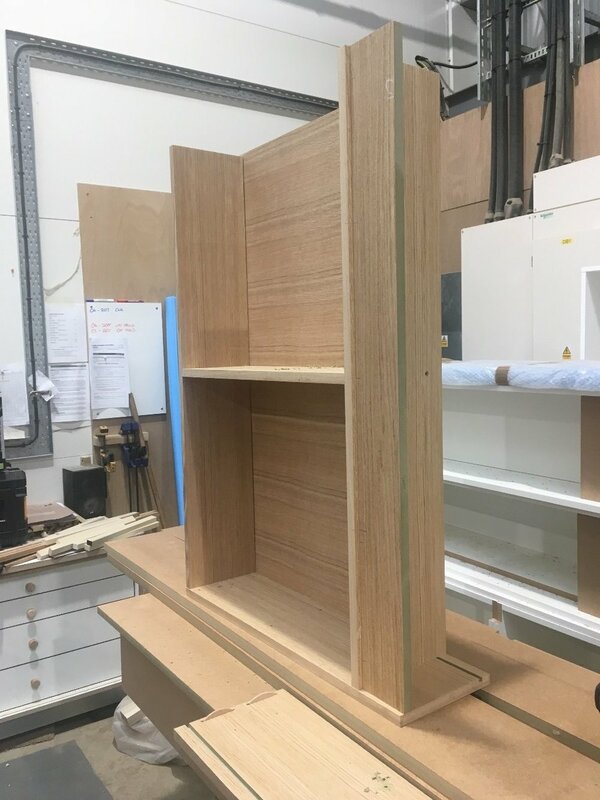 My first step to constructing my masterpiece was to cut the smaller panels for a bookcase to their core size based on the drawing that had been completed on Monday in the office. The panels were all 18mm and able to go through the lipper resulting in the finished product being clean and wonderfully executed. Even on the short walk from the joiner’s bench I was working on to the sander, the feel of the factory was explicitly light and welcoming. Whether I had been introduced or not there was always question of how am I which ensured, in my mind, that Thorpes was a company with its employees at heart. The purpose of calibrating the panels is to ensure that when the panels go in the press, they don’t have lumps and blemishes as the unfinished wood will create an uneven surface resulting in a poor finish. This guarantees that quality products leave the factory and arrive safely on site ready to be fitted and finished to a superior standard. Whilst this was all going on, veneer leaves were getting prepared, ready to be pressed. Once both the veneers and the panels were ready it was time to press the various sections of the bookcase to give them their oak finish. This process was completely alien to me but by the end of the day I was able to prepare a panel and clean it up ready for the next stage in production. All that was needed now was to cut the panels from core size down to finished size. This involves using the panel sizer, a machine that I used on my last time working here. Due to this I was given more of a free role and this gave me the confidence to be able to cut the panels down and remove them safely to minimise the chance of breaking the panels or snapping the veneer. With all the panels now being the right size, we had all the components to be able to construct the bookcase. To prevent everything on the shelves from falling out of the back, a thin backboard was cut. A small groove was required to slot the backboard in before screwing it firmly into the sides and the central divide to prevent it from falling out of place and having the contents tumbling out after it. The machine needed to complete this was the spindle. The next process involves putting in biscuit holes and gluing the panels together. When this process is done the cramps to hold the panels in place must be applied gently. When the areas that needed to be cut are highlighted a biscuit jointer is used to cut in the gaps in the panels where the biscuits will fit in order to glue the hold bookcase together. It is at this stage the pieces be slotted together for the first time to see what the whole case will look like. When the unit is together loosely like this it is imperative to ensure that the bookcase does not fall and, as a result, break on the floor. However, a major positive of constructing the bookcase like this is that it is easily visible to see where all of the screws and nickel pegs will be inserted. Jigs can then be constructed and used to accurately drills holes where the screws will go to hold the shelves and the back board in place. The edges around the case will need to be sanded using an edge sander and then the rest of the panel faces will be sanded using a drum sander to make sure that all of the faces of all the panels are ready to be sprayed and no blemishes will emerge and ruin the design of the case. Once this is done the corners and edges will need to be arrised up and finished by hand to provide a clean and professional finish. Then it was all taken to the spray shop to be sprayed and finished up to highlight the lovely colour and pattern of the oak used. Once this is complete I was at the penultimate stage where the panels are ready to be glued together and constructed. Because the biscuit holes are in it is just a case of gluing the biscuits in and attaching the connecting panel before using quick cramps to hold them resolute. The only elements that are not for gluing and cramping are the shelves and also the top. It is important to not attach the longer cramps directly on the wood as this can cause damage to the product. A block of sanded wood should be placed between the cramp and the side panel to make sure that the Thorpes high standard of work is adhered to. Once the glue is dry the nickel pegs can be inserted into the holes and at this stage the bookcase begins to look complete. Lifting the top slowly and approaching with caution is sensible at this stage as the heavy top could damage the whole bookcase should it be dropped by accident. Even on the closing stages of production, the Thorpes team ensure that all manufactured goods are finished to an exquisite level. As a whole the project was amazing to work on especially considering I have never had the chance to take part in a project on my own like this before. The skills I have learned will be able to be carried across into all aspects of my life. Working with people who are older than I am is really helpful as obviously their life experience long outweighs mine and the advice that they give can be really useful and does help my decisions in further education. The support they have given me has helped me to build my bookcase and without the aid and guidance it would not be complete. The final design is very good and I am happy with the finish but it will not be able to be fully evaluated before it is placed in its intended position to ensure that it fits well. All the measurements were taken and followed precisely, checking at each stage, and the finished product matched the drawing perfectly. The project was a great experience for me to see what life at Thorpes is like and I have enjoyed my time here greatly and want to thank all of the staff for letting me come and have this amazing experience.